So it’s me, Rhys, back with another review linked with Wicid.tv and the Motorpoint Arena Cardiff. After seeing some of the matches on this card (one in particular! ), I had no option but to attend WWE Live in Cardiff! Unfortunately I couldn’t get a photo pass for the event so this meant I could concentrate more on the action and take it all in as something I don’t get to do enough of, BE A FAN! I will say one thing I noticed about the show is that there were A LOT MORE people in this one in comparison to the last time I reviewed a WWE Cardiff show. It wasn’t sold out, but definitely a lot more seats were filled here, which was great to see. The crowd were on fire through-out the whole show. Some matches were quieter than others which is expected due to the level of attention the stars get in the matches on live television, but they still reacted well through-out. A major opener to kick off the show. The crowd was supporting both of these charismatic stars, despite Orton being rather cold and calculating in his offence. Jeff was as enigmatic as he is on the television, doing a few high risk moves. But it was that RKO ‘Out of Nowhere’ from The Apex Predator that eventually helped him pick up the pinfall victory. It was kind of surprising since I expected the hero, Jeff Hardy, to win the opening match but both stars were super popular with the crowd so it worked anyway. This match started off very quickly as The Colons attacked The Uso twins while they were making their entrance. Not much to say about this match as it was over before it started. The Colon cousins started out with some great tag team psychology, but they let their height advantage get to their heads. The Usos introduced them to the ‘Uso Penitentiary’ as they came back with their own tag team offence. They finished off The Colons with double superkicks to get the pinfall victory. Wait, did I just read that right? 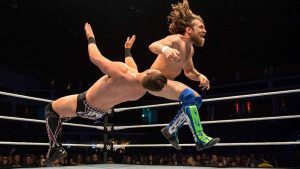 Two Welsh Wrestlers, faced each other at a WWE show in Cardiff? Maybe I clicked on an Attack! Pro Wrestling article or some different one by mistake? NOPE! THIS. REALLY. HAPPENED! Now this match definitely had some of the weaker crowd interaction despite these men being from Cardiff (Mark Andrews) and Blaina (Wild Boar). But with both men only being featured sparingly on the WWE Network show NXT UK exclusively, I doubt many people would have recognised them anyway, unless they went to independent shows in the UK. The match itself started very technical then soon played into both men’s strengths. Boar showcased his powerhouse offence mixed with some surprisingly speedy and explosive moves using his entire body to do damage. Mark fought back with his high-risk athleticism and top rope mastery. In the end, Andrews, hit the Stundog Millionaire Tilt-A-Whirl Stunner, after that it was Time To Fly as he hit a top rope Shooting Star Press for the pinfall victory. Now I would be SLIIIIIIGHTLY biased to say this was my match of the night (to the shock of no one). This is mainly due to these two being two of the head trainers of the same training academy where I am currently training to be in the same profession as them someday. So maybe it’s less about the match itself, which was still very well done by both, but more about the overall moments this match created. Let me remind EVERYONE reading that this is the FIRST EVER WWE match to take place in Cardiff, Wales, where both competitors are born and raised in Wales. That is such as AMAZING moment that both of them can say, ‘Yeah… we were the first to make it happen.’ So well done to both Mark and Hitch. It may be an overused term in Wrestling, but after all the work they have done in their careers, they truly deserved it. Before the match began, The Aussie ladies came out with mics in hand, ranking whether certain things were ‘iconic’ or not. I feel as though this was a missed opportunity for them to get some instant heat (boos) from the crowd. Both women were born and raised in Sydney, NEW South Wales, Austrailia. They could have easily come out and said they were from the BETTER South Wales, since you know, the show WAS in Cardiff, SOUTH Wales. But it is what it is. They were still booed anyway, just the extra little touch would have been nice. Maybe next time in Cardiff if they’re a part of it? The match itself was what you’d expect from these two teams if you’ve see their work. The ladies from the land down under made sure to let the crowd know that they were the greatest thing you’ve ever seen while double teaming the fan favourite ever moment they could with sneaky manoeuvres. Naomi brought incredibly athleticism and a playful offence while Asuka brought that Empress sass she is known for in the form of super quick submission holds and sickening strikes. The match came to an end when Asuka locked in her signature Asuka Lock for the submission victory. 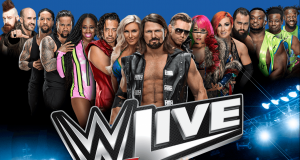 In one of the initial changes to the full card from the Motorpoint website, what was originally a single title match between Shinsuke and Mysterio, they decided to add in the Birthday boy, Andrade to make it a triple threat. Shame there was no mention of this as it could have led to some laughs if done right. Mysterio came out to the delight of all the mask wearing kiddies that made up over 50% of the Motorpoint audience. Shinsuke, despite his more cocky persona, still had his supporters from a few different sections, while Andrade was….. just there, he didn’t even get any love on his birthday. That’s really depressing. This match was a nice mix-up of styles. You had the champ Nakamura with his Japanese Strong Style, Rey Mysterio with his Lucha Libre influenced style, his speed and agility, and then Andrade with his Mexican style influences that brought his own flavour to the Lucha style. The match came to an end after Rey Mysterio hit the 619 on Almas, but after a surprise Kinshasa Knee to the head from Shinsuke, was thrown out and the champion stole the pinfall victory after covering Andrade. Before this match took place, there was a ton of bad guy mic work done by The Awesome One as he made fun of the crowd for being ‘FAT, UGLY, CARDIFF DIRTHOGS’…. Miz, you’re cool, but you need to come up with insults that actually sound insulting next time. He also delayed everyone as he provided the worst strip tease ever taking off his jacket, headband and sunglasses to show everyone ‘what a real man looked like’, though I’ll let it slide because, come on, that is one fine looking man. Villain or not, you’d be silly not to think that. Bryan scared Miz away as he took off his glasses, then got on the mic himself to tell everyone they were ‘Wonder, Beautiful, WWE Universe Fans’ and he then took his shirt to show everyone what a REAL man looked like. Of course he got more cheers and trademark YES! Chants because you can’t boo someone as wholesome as Bryan… plus that beard though. The match itself was well done and did have some continuity from a few nights prior as The Miz apparently injured one of his legs at the Crown Jewel show. I don’t know the full story on if it’s a legit injury or part of an angle. But I digress. I bring that up as The Miz was either selling this injury really well, or he was working with this slight setback even at the start of the latest WWE UK Tour. Miz made sure to mock Bryan using kicks of his own whenever he could, while also using that cocky showman style he is known to use. Bryan fought back with the crowd fully behind him as he connected with strike after strike, the occasional top rope manoeuvres and of course some submission moves just for added measure. The match came to an end after Bryan managed to hit his Single Running Knee finisher and got the pin. The crowd were of course ecstatic and this left the people on a good note when heading to the intermission. This match, if you can really call it one, took place after a short intermission. I say it wasn’t a match so much as it was both teams coming out and posing for the crowd, feeding off reactions. Everyone even attempted the splits in the ring, well, Rusev didn’t, because he ain’t as flexible as the others in this exchange. There was also a dance-off where R-Truth, Carmella and Lana all did that ‘Floss’ dance, which I’m not going to lie, is always amusing to see. That’s one current modern day trend that I don’t mind seeing. After some more dance moves, Rusev rolled up Truth for a quick 3 count. The four of them embraced and the crowd had a nice wholesome cool down moment before getting back to the actual show. This match was more comedy than actual wrestling, which you come to expect since The New Day were involved, alongside Xavier Woods with the ever so lovely mic’d up trombone, Francesca II: Turbo. Maybe it’s a different one? I’ve lost track with how many Francesca’s there’s been now. They had fun facing off against Cesaro and Sheamus, especially with Sheamus wearing his man-skirt. Both teams worked very well together as you’d expect, Cesaro and Sheamus made use of their strength advantage throughout while mocking The New Day at every given opportunity. However, Big E did match them both with power of his own, all the while swaying those can’t stop won’t stop hips of his. Kofi of course used his incredible athletic prowess whenever he could while performing double team manoeuvres with his buddy Big E. In the end, they weren’t able to get up to The Bar’s level as they lost by pinfall to the dismay of the crowd. Now this match was interesting because of the reaction that I EXPECTED from the woman involved. To those that don’t know, Becky Lynch has changed character since August, she now has a more self-absorbed demeanour while also being more cold and demanding. She still shows some level of that STRAIGHT FIRE she has always had but with a bit more of an edge if you will. The crowds on TV, despite some of Becky’s more ‘bad girl’ responses, the crowds have still been supporting her as the woman who changed her, Charlotte Flair, is getting thrown into the title picture quicker than the way Becky did. Charlotte fought for the title within a few weeks of coming back from her injury, where as Becky had to fight for her chance for months. Then when Charlotte won the title at SummerSlam, all hell broke lose. 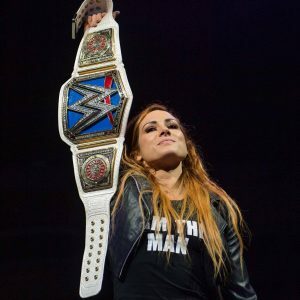 Becky won the title from Charlotte at the next PPV, they’ve had a few matches with dodgy results, and then of course, they had what many are considering the best Main Roster Women’s match of ALL TIME at WWE Evolution – Becky Lynch beat Charlotte in a Last Woman’s Standing match. Now due to WWE’s production team wanting you to think Becky should be booed, I expected the more casual crowd at the Motorpoint to follow the same logic. Boo Becky, and Cheer Charlotte (huh, unintentional alliteration)…. But I WAS MISTAKEN! Becky was CONTINUOUSLY CHEERED by the crowd with parts of the crowd chanting her theme song. Meanwhile for the most part, Charlotte got her WOOs, but also her definite boos. Maybe they expected this heading into the match, but their demeanour reflected this as well. While Becky was still somewhat cold, she still had very heroic mannerism and seemed very fan friendly, meanwhile Charlotte seems a lot more like The Queen of old, posing like the world should bow before her. The match itself was still pretty great, these two are always gold in the ring together. Charlotte showing her athletic prowess, her father’s tribute chops and other flashy moves, while Becky had her spitfire speed and quick strikes and suplexes. The match finished with a surprise roll-up by the champ for the pinfall victory. This made me think that MAYBE she pulled on Charlotte’s tights since the result was so sudden and I didn’t get a clear angle on if she did or not. But regardless, the crowd cheered her on as The Lass Kicker retained her championship again. A truly great match to end such a jam packed show. 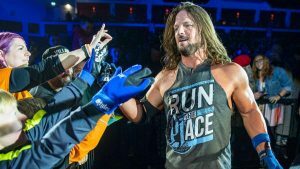 You had the destroyer, Samoa Joe using his heavy hits and powerhouse moves going against AJ Styles and his high-risk high reward offence. Add in the different weapons that were used, like Kendo Sticks, Steel Chairs and a Table, and you were sure that the crowd would leave the show happy. The show almost ended on a sour note as The Bar ran out from the the back and attacked The Phenomenal One for what seemed like no reason. They set up a table which Joe almost used on his long-time rival, only for The Usos to appear and to fight off The Bar to even the odds in this No DQ match. Styles managed to jump out of the way as Joe charged at him, sending Joe through a table that was set up in the corner. Styles hit his trademark Phenomenal Forearm off the ropes and secured the pinfall victory. He grabbed the mic to thank everyone for making it to the show and how the crowd had been excellent throughout. So yeah, that was the latest WWE show from the Motorpoint Arena Cardiff. Not sure if I’ll be at next one, it’ll likely be after Wrestlemania and I will be finishing up my time with Wicid in June of next year. I can cover it, I’ll do my best to do so. Until then, I hope everyone enjoyed up my write-up, and I hope it can encourage other young readers to sign-up with Wicid and write for them too. Who knows, maybe you can be the new younger wrestling reviewer that this site needs. Until that day happens, you’re stuck with me until June 2019. *Images courtesy of Motorpoint Arena Cardiff & WWE.